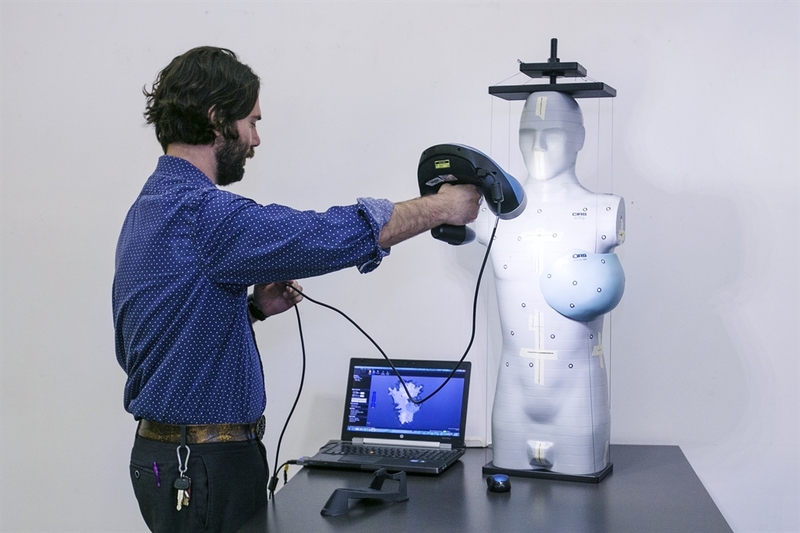 Vincent Cellucci, CxC studio coordinator for the College of Art + Design, uses a 3-D scanner to research breast cancer treatment. Dr. Wayne Newhauser, Dr. Charles M. Smith Chair in Medical Physics, and a team of graduate students are researching the application of 3-D scanning and printing technologies to improve cancer treatments. “Radiotherapy is used for many breast cancer patients. The effectiveness of controlling the primary tumor is already pretty good, with about 80 percent of patients surviving long-term. But drugs, radiation and surgery each damage surrounding tissue. We’d like to minimize that damage as much as we can,” Dr. Newhauser shared. 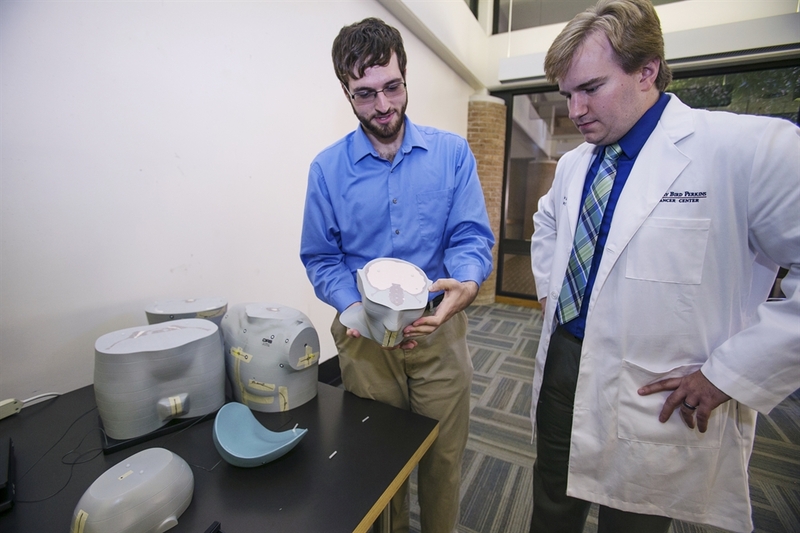 Dr. Newhauser and his graduate students want to use 3-D technology to scan patients, create a virtual model of their bodies, and print a dimensionally and density-accurate phantom. Having this capability will facilitate research that aims to take into account each patient’s unique anatomy for a personalized approach to treatment. 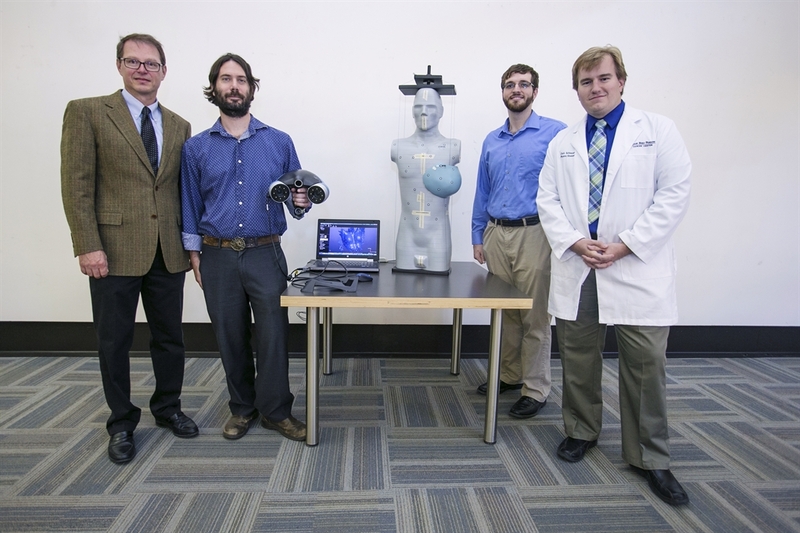 (From left to right) Dr. Wayne Newhauser, Vincent Cellucci, and graduate students Chris Schneider and Will Donahue with a 3-D scanner and phantom. 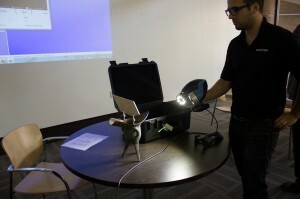 Vincent Cellucci, the Communication across the Curriculum (or CxC) Studio coordinator in the College of Art + Design, teamed up with Dr. Newhauser for the project. He predicts that, in the near future, 3-D technology will transform virtually every industry, which is why the research project is a collaboration of several units across campus. “LSU is a community. Not only do we work with each other, we know each other. The team working on this project includes faculty members from LSU Physics; Art + Design; Textiles, Apparel & Merchandising; as well as a partnership with Pennington. To be able to form such a diverse interdisciplinary team in one’s own community isn’t an opportunity that happens every day or overnight, but the willingness of the LSU community to collaborate makes it easy for us to reach out to each other and form mutually beneficial partnerships,” Cellucci said. Dr. Charles Smith, a graduate of the LSU School of Medicine and a donor to the Medical Physics & Health Physics Program, credits medical physics with prolonging his own life after a battle with cancer. The Medical Physics Program is a partnership operated by LSU and Mary Bird Perkins Cancer Center. “I know that everyone hopes to find a cure for cancer, but I wish more people would recognize the importance of medical physics training in oncology. Keeping that training in our area will provide the best treatment for patients, so they won’t have to travel far away from home to get the same results,” Dr. Smith said. Trey and Kim Bowman, who founded the Bella Bowman Foundation in memory of their daughter, also give to the program. They work with Dr. Newhauser and the Mary Bird Perkins Cancer Center to research brain stem necrosis, the rare side effect of proton radiation therapy that Bella experienced.